While its right there in the name, sushi isn't the only reason to go to Fuji. This restaurant provides a unique Japanese experience right here in the Midwest. Grab a seat at the bar, cozy up in a booth, or watch your food prepared fresh in front of you. Sunday night is kids night, when kids meals are half price from 4-9pm, and Tuesday is half-price martini night along with a sushi special from 4-9:30pm. Tap beers are 99 cents, house-made drinks are $3.25, and two dinners come with a free appetizer during the bar's happy hour, which runs 4-6pm Monday through Thursday. The relaxing ambiance and full sake menu at Fuji Sushi & Steakhouse is sure to keep you happy and coming back. Ask about their birthday special. Vegetarian options, private party room. Fuji's full sake menu will not disappoint. Three beers are served on tap, and several imported beers are also available. Happy hour is 4-6pm Monday through Thursday, where house-made drinks are $3.25 and tap beers are 99 cents. Check out their martini/sushi special on Tuesday nights: Customers can create their own martini and sushi dinner combo for a discount. Good food. Bit pricey but that is hibachi for you. I've never had bad food. Food is great, and we enjoy the entertainment of having the food prepared in front of us - if you tell them up front not to chuck the food at you, there isn't an issue. We consider the menu somewhat pricey, though, so that keeps us from being regulars. Did not enjoy the food. 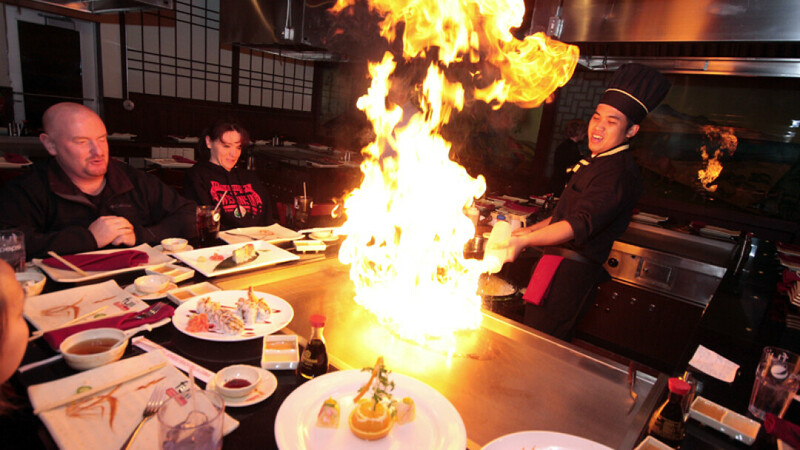 While the Hibachi experience is entertaining the prices are high and the food is just ok.